Viburnum dilatatum. Xiangying Wen.www.efloras.org. (Accessed 6/2014). 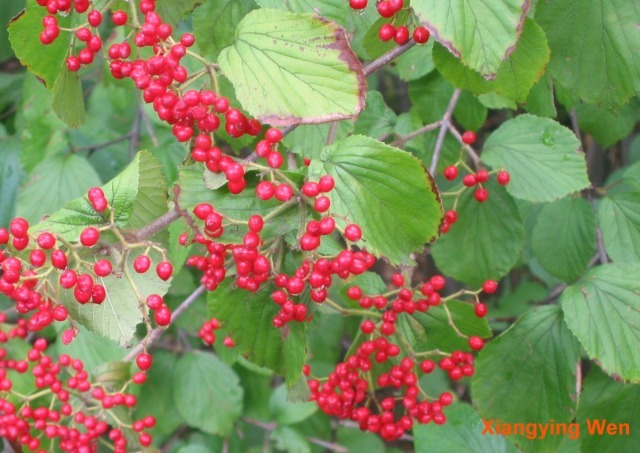 Viburnum dilatatum Shrub to 3 m tall, erect, bushy, young branches brown hairy, lenticels orange, winter buds with two scales, densely hairy. Leaves opposite, stalk to 0.6-1.6 cm, blade 6-12 cm long, rounded to broadly egg-shaped, sometimes widest above middle, tip abruptly pointed, base rounded to slightly lobed, hairy on both sides, margin coarsely toothed, veins 5-8 pairs, pinnate, ends running into marginal teeth. Flowers white, small, petals hairy (use lens) stamens longer than petals, in numerous flat-topped clusters, 8-12 cm wide with hairy stems 1-3 cm long; blooms May-June. Fruit fleshy, bright red, shiny, to 0.8 cm, 1-seeded (Rehder 1986), Oct.-Nov., often persistent into winter, (Dirr 1983; Rehder 1986). probably eaten by birds. Habitat: Planted on edges of natural areas and overgrown, may also escape.